Don’t these look delicious? …and so cute too! 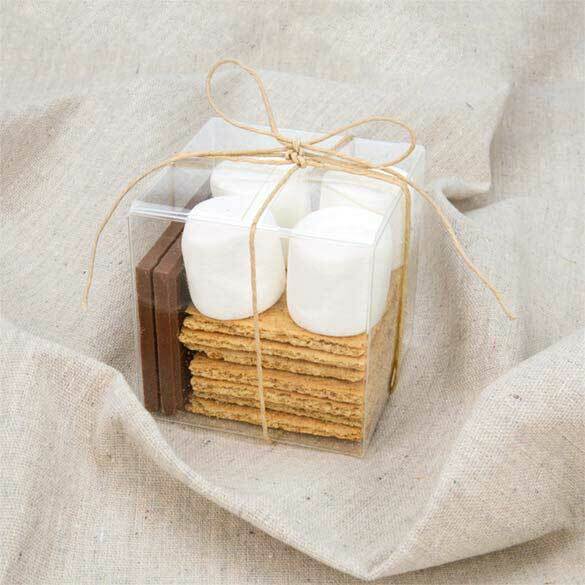 These s’mores kits make perfect wedding and party favors, especially for those on a budget. With Memorial Day coming up, these are perfectly in season, so invite your guests to break out the roasting sticks and enjoy some company around the fire. 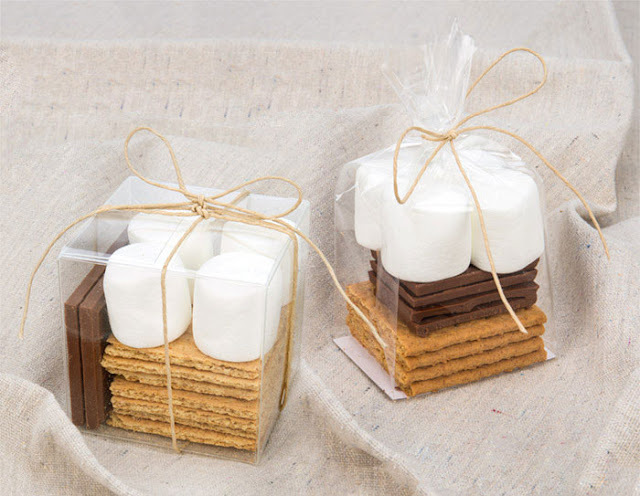 In this post we will show you how we make the s’mores kits in our clear boxes and bags, and then we will go over the cost for each of these favors. 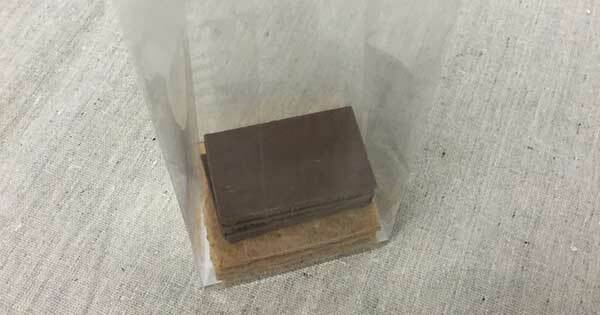 Step 4: Place 2 of the pieces of chocolate into the bag on top of the graham crackers (You will notice that we put a full bar into our bag, but you can easily get away with a half bar. 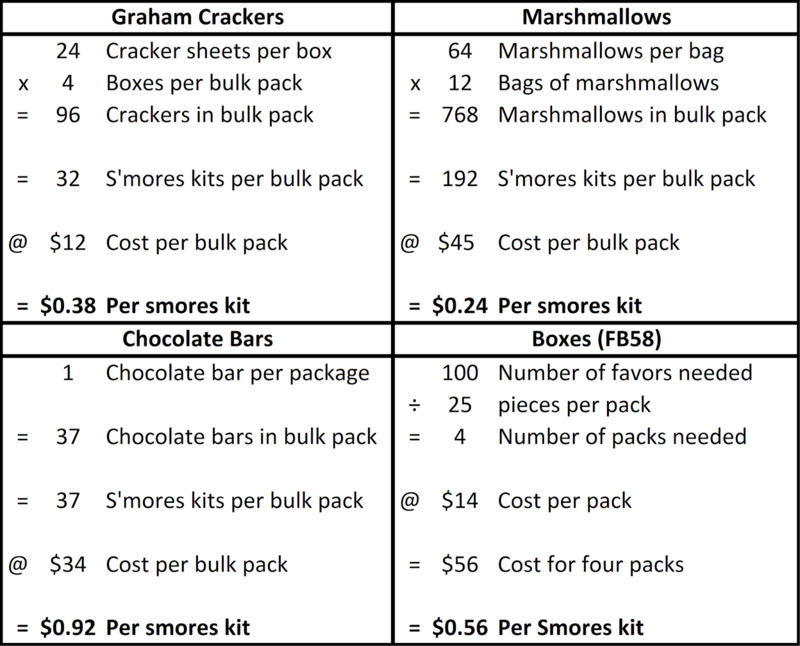 Remember, you only have enough grahams in there for two s’mores.). So, how much do they cost? We ran through some quick numbers to help serve as a guide. 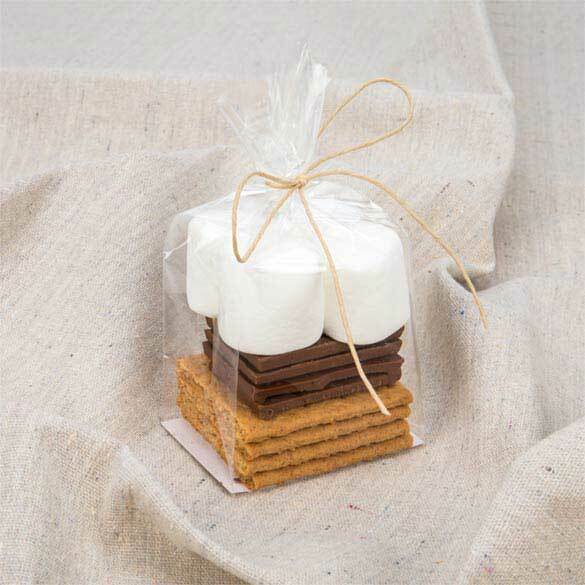 These are estimates, so don’t forget about the cost of shipping or adding on any embellishments such as ribbon or twine. 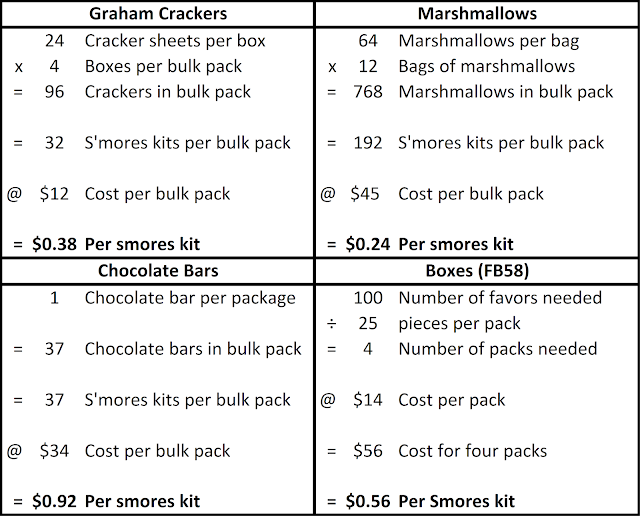 So the total cost for the s’mores box is $2.10/ea (+ any shipping or twine/ribbon costs). 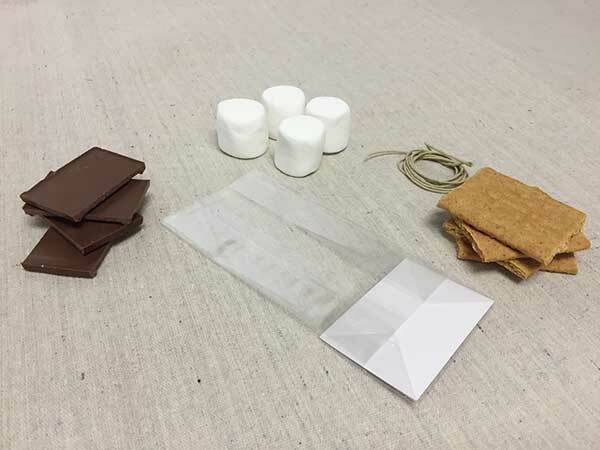 The bag kit is a great option that can cost about half that of the box. 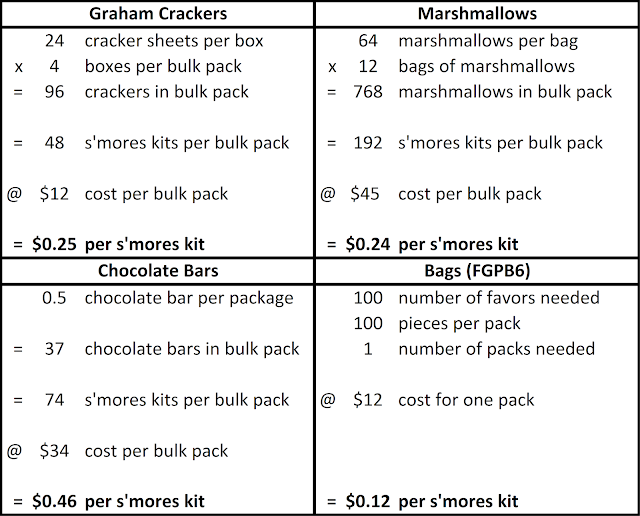 So, breaking things down this way you will see the cost of the bag s’mores kit to be $1.07/ea. (again, + any shipping or twine/ribbon costs). 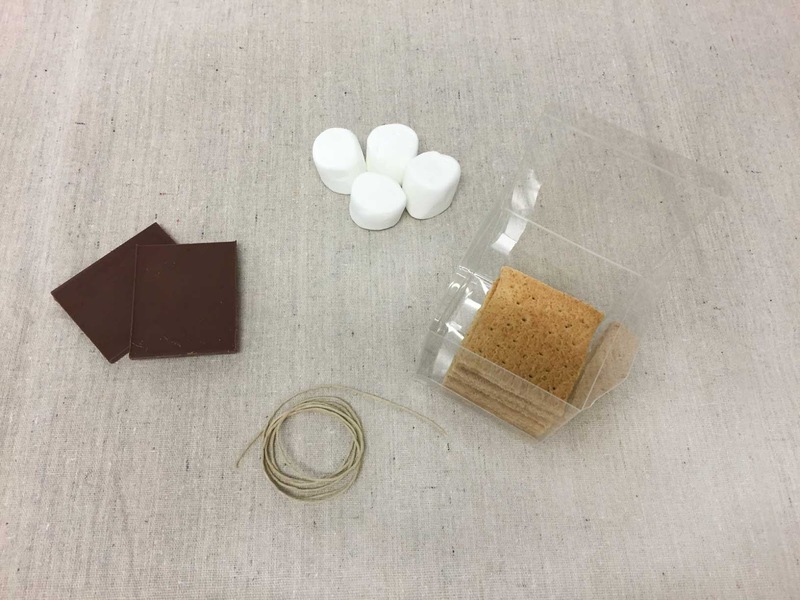 Note that for our s’mores bag kit, we used the full chocolate bar (we really like our s’mores to be extra chocolatey). Feel free to do the same, but it will increase your cost slightly. 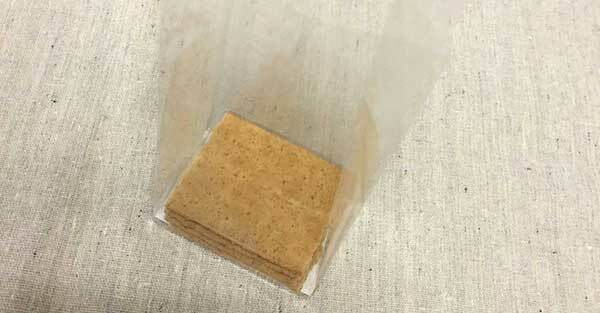 With only enough grahams in there for two s’mores, you can easily get away with a 1/2 bar per bag. 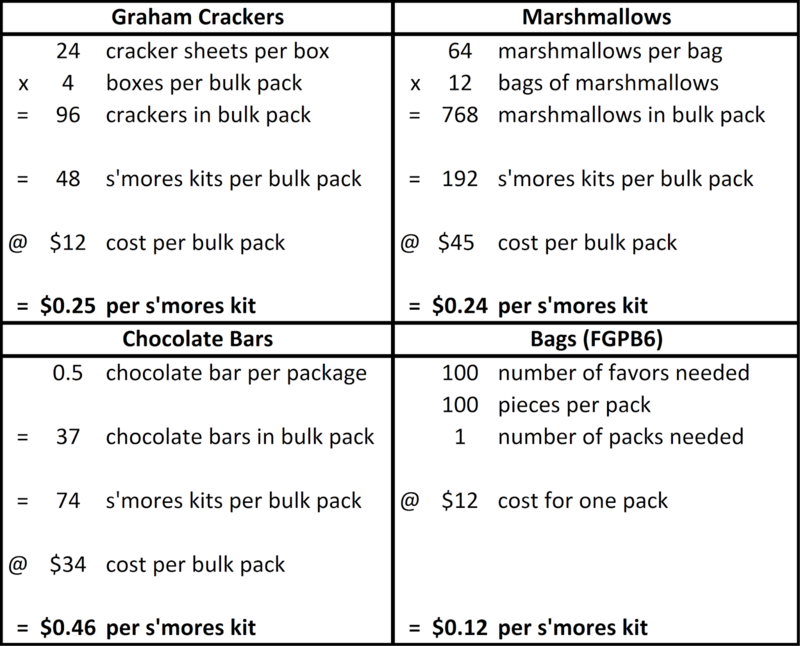 Please note that these prices do not take into account any broken graham crackers. Be careful with the crackers! 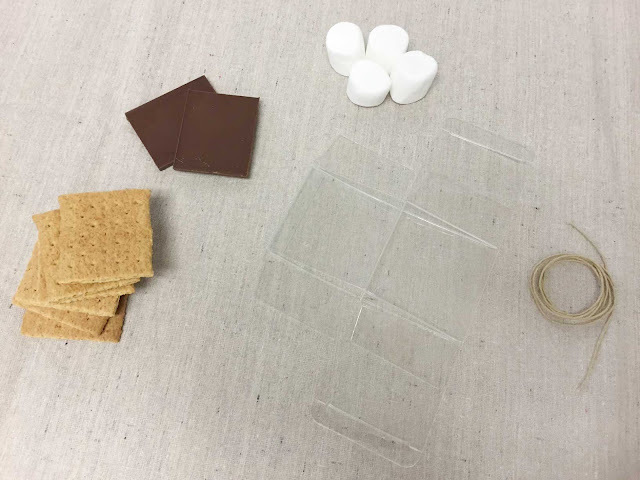 We found that after making quite a few of these s’mores kits that you will come across one or two broken pieces per box. These s’mores kits are cute, economical, and sure to leave your guests remembering your wedding or party the moment they begin roasting the marshmallows over the fire (or stove!). Let us know how you embellish your kit to make them look great. Mention us on Instagram (@clearbags) or leave a link in the comments below. 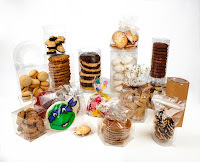 We also asked our contact a few questions about how packaging helps them connect with their customers. Hopefully this helps other photographers out there get some ideas for what they can do to create a great brand experience for their customers. I think we’re unique in our approach to give an unequivocal “yes!” to any request and then find a way to get it done. We try to take care of every customer, and as a result, we end up doing some pretty extraordinary jobs. 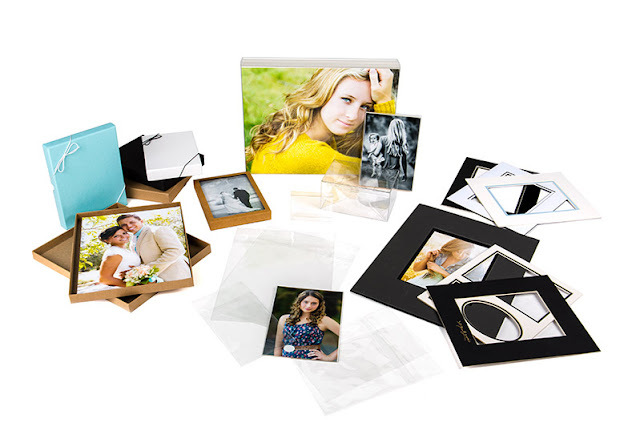 We package all of our photo enlargements 8”x 10” through 12”x 18” in ClearBags Protective Closure bags and chipboard. 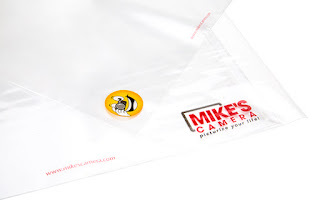 We like the Protective Closure bags because it keeps the adhesive facing away from the print, so the customer can reuse the packaging over and over. ClearBags custom prints thebags for us with our logo, as well as our Smile Club logo and URL to reinforce our branding messages. 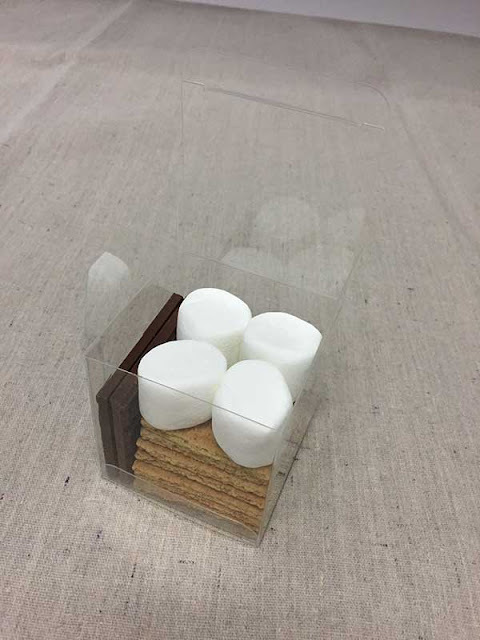 We also use the FB52 5” x 7” boxes for packaging greeting cards and envelopes. We have an entire stationery department that produces folding graduation, wedding and holiday announcements and our standard presentation is the box with a belly band (see below). 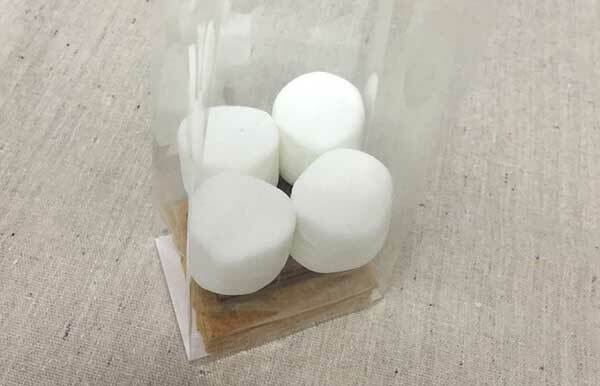 How does that packaging help you? Because many of our customers are photographers, they love the look of our packaging and want to buy it for themselves. 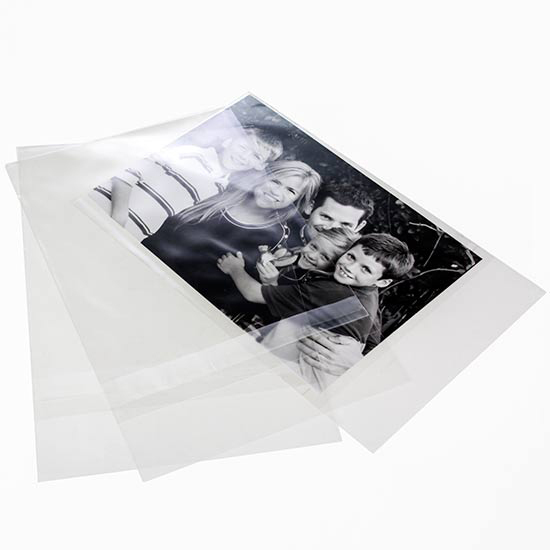 ClearBags has retail resale packs that we also sell for standard photographic sizes. How long have you been working with ClearBags? We’ve been working with ClearBags for 11 years. Have a consistent brand identity throughout your presence, both online and in printed materials such as advertising and collateral. Packaging should carry that through. Wherever possible try to “Wow!” your customers with the presentation of your services with a consistent and beautiful presentation. Our customers and staff love being able to see their pictures as soon as they pick them up! How can others connect with you? What is the best way to print & package my photographs? As you look to grow your photography business, have you ever wondered if you are processing and printing your photos in the best way for the size of your business? Should you process at home with a photo printer, take them to a consumer lab such as Walgreens or Target, or use a professional photography lab? Whether you’re a new photographer or a long time professional, there are many photo processing options available. Here at ClearBags we have provided packaging for 25 years, and we work with thousands of photographers each year, both large and small. We also attend the largest photography trade shows in the US. 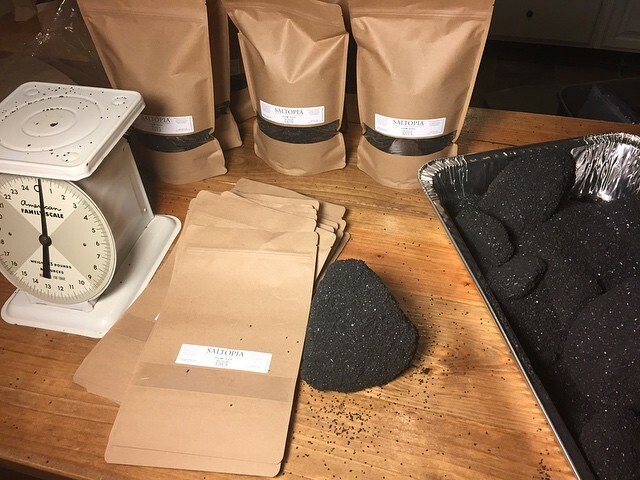 Today we want to share some of our experience and take a look at the benefits and drawbacks of home processing, consumer labs, and professional labs, as well as the role packaging plays in selling prints. Which ways are best will depend on the size of your business, the size of your project and the quality you expect. Which method should I use to make my prints? Before you choose a print method you will need to consider the pros and cons of each one as well as how the prints will be used. If you’re simply sharing images with family and need a quick affordable solution, consumer labs may be your best option. If you want complete control and are looking to print your images yourself, there are a lot of quality options for keeping it at home. If you’re a professional who needs the best quality printing or a higher-end or unique material, a pro lab might be best. Whether you’re the family photographer or a professional, printing at home with a photo printer is a good option if you want to have control over the final print. The cost to print on your own will depend on the size of prints, the quality you’re looking for, and the quantity at which you produce. Most desktop printers will work for sizes up to 13x19. You can find a wide range of professional-level photography papers from brands such as Moab, Canson, Hahnemuhle , Epson and Kodak. If you need larger prints there are also wide format printers. These are typically for professional use and are a significant investment in the machine, paper and inks. Having options in printers and papers means you can experiment until you get the results you want. Printing at home, with the right equipment, is a great option for both novice and professional photographer. We’ve all used our local consumer labs like Costco, Target and Walgreens. You can get prints made in a short amount of time at affordable prices, perfect for sharing with family and friends. While they are convenient and affordable, consumer labs offer few choices in paper types and typically specialize in smaller print sizes. In terms of quality, consumer labs generally get the job done, though they are a few tiers down from the bets results. That’s because, prints from consumer labs are limited to a standard set of machines that don’t require expert photo technicians. These printers are calibrated to make adjustments to your image colors and contrast, often producing inconsistent results compared to the original file. Expect a loss of detail and unexpected hues not found in the originals. So, the trade-off for quick and easy is often mediocre results. If you are looking for an expanded range of sizes and paper types, professional labs would be the best choice. Whether you’re looking for the best result, or if you just want someone else to deal with all the details in producing high-quality prints, professional labs can accommodate almost any size of photography business. Labs such as Bay Photo, White House Colour, Miller’s Professional Imaging and Pro DPI offer significant advantages over consumer labs. You will have access to a broad range of paper types, larger paper sizes and special surfaces to print on, such as wood, metal, ceramic and canvas. Choosing the right lab will take research. Pro labs can send test prints to compare for quality and accuracy. Most offer similar products, so you will need to look at the types of products and finishes that best fit your needs. They are spread out across the country so you can look for the lab nearest your location or find ones that offer expedited shipping at low cost. In terms of quality, pro labs use trained technicians who can adjust for optimal results and print with higher quality inks that result in a more dynamic tonal range for richer detail and colors. You can also request to print as-is, if you are confident in your shooting and editing skills. Pro labs have a vested interest in making sure you receive the best prints possible and will make sure you are happy. 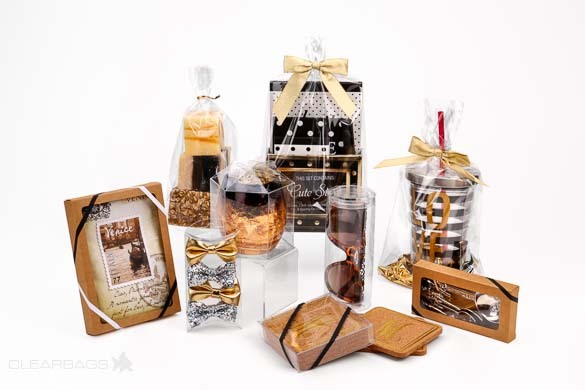 Once you have chosen the best printing option for your business and you are offering prints for sale, packaging plays an important role in adding the finishing touch for a professional look. It’s the first thing your clients see before they get the chance to view the final results of a special event they trusted you to shoot. 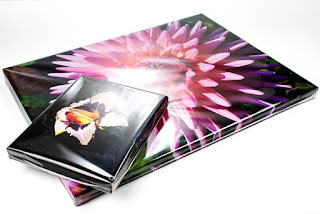 Photographers use packaging as a means to not only protect and secure their prints, they also use it to reflect their brand (or unique vision). 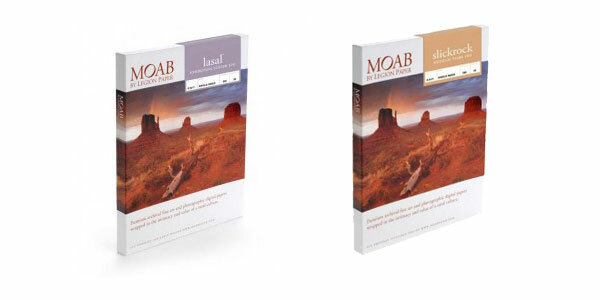 Photo packaging will vary depending on the final look and price you want to give your clients. 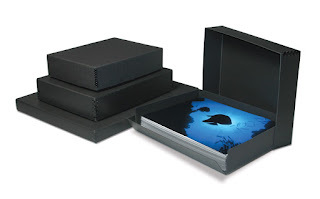 The most common materials to package prints are made of archival clear plastic, premium paper in a variety of finishes, heavy duty chipboard boxes as well as wood boxes for prints and USB drives. All these materials can be imprinted and customized. Archival clear plastic is the most cost-effective solution in the market. 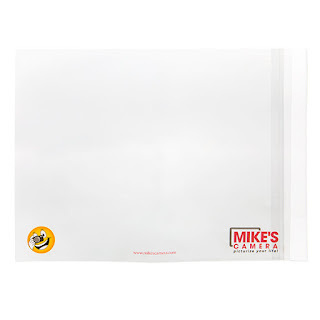 You can find plastic sleeves in a wide range of sizes to fit your prints and even accommodate products with higher depths like gallery wrapped canvas. They allow the print to be seen while providing protection. Paper products tend to be more expensive than plastic. Paper products like folios, photo cases and mounts come in a variety of colors and can be used to coincide with your brand or print colors. If your prints have more natural tones a Kraft photo case can give it the finished look. If you have a more traditional photo event like senior portraits or weddings, mounts with foil finishes will give it a polished look. 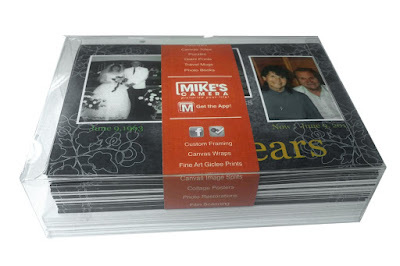 Print/portrait boxes are a good option when providing bulk packaging. 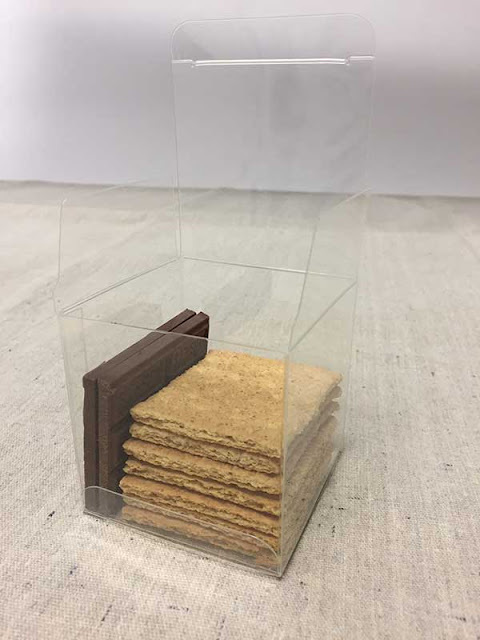 Heavy chipboard print boxes can be found in a variety of colors and give a high-end boutique look. You can add finishing touches like ribbon, tissue and labels to complete the finished look. There are also DIY options if you are really looking to create your own look or adding to the options listed. Shipping boxes and mailing sleeves would be another packaging solution to consider. Most are made of cardboard and heavy paper stock in different sizes and colors. The most important feature to look for is protection during delivery. ClearBags offers complete solutions for your finished look. It’s our job to help create innovative packaging solutions for all these exciting products. Hopefully this gives you a better idea of the different printing options you have and which might be right for your business. We encourage you to give the professional labs a try if you haven’t already, and of course to let ClearBags help you for your photo packaging needs.